In this post we will attempt to place the city within its current global context by looking at current factors shaping cities as well as the historical elements that have defined urban form. Cities are the fundamental responsibility of architects. Too often our profession has only been concerned with “the building”. We need to (and many architects are) refocus our creativity towards the design of cities. This goes beyond mere “respect for context” or historical allusion; it encompasses a deep understanding of which elements are successful and which are unsuccessful in urban environments. It allows for fresh, creative, and modern solutions that create a continuum between the past and the present. We will first look at the factors affecting the scale of global urbanism. Then we turn our attention to the things that have shaped the physical form of the city in a later post. How did we find ourselves in this position of sprawl-dominated metropolitan areas and characterless places? The truth is that it is a result of miscalculation and misallocation of resources at a colossal scale. The resolution of this situation will not be easy. It will require sacrifice and cooperation at a level that we are not accustomed to. This is what the most successful cities world-wide are doing. The factors creating the requirements to be a global player are also channeling cities towards unsustainable urban forms. We see this most acutely in emerging Asian cities. But this trend also affects the cities and small towns that we are studying in the midwest, particularly the “rust belt”. A significant aspect of global competition in regards to cities is the quality of life that attracts individuals to a given city. Places Rated Almanac has identified the nine 9 Factors below in determining quality of life in urban areas. The exact wording of factors change from time to time but, generally, they are: Cost of Living, Job Growth, Crime Rate, Healthcare, the environment, Transportation, Climate, Recreation, The Arts, and Education. These factors frame the way we think about successful cities. But, these factors not only affect cities of global stature or aspirations, they also affect small towns. At the Strong Towns blog, Chuck Maroun, states that the key competitive aspect of smaller urban areas may just be their infrastructure. Quality of life aspects are important but the study of urbanism and cities can not be properly understood without the study of the history, economic developments, or societal and cultural changes that happen concurrently. In order to design cities effectively we must draw upon research developed in these interrelated fields of activity. Aaron Renn over at The Urbanophile has a take on globalization that looks at it from the standpoint of each city’s economic competitiveness and branding. Our approach will be a little different. We will look at key concepts that frame globalization with respect to urban design and policy. A factor that influences patterns of urban development and the kinds of relationships fostered between different “cultures” within the city. Partitioning space through the establishment of Legal boundaries affect the city’s ability to raise revenue. Electoral boundaries affect the outcome of elections and the leadership and vision for the city. Cities are simultaneously the products and shapers of economic, social and political change. affects the behavior of both the producers and consumers of goods and services. Physical accessibility to jobs, schools, stores, parks, healthcare, are important in determining the level of quality of life in the area. The distinctiveness of metro regions, cities, districts, and neighborhoods is critical to understanding cities, mapping variations in areas, identifying spatial patterns and establishing linkages that create functional regions. Place also influences decisions on where to live, where to locate a business or how comfortable one feels in an area. We are now in the era of the global city. 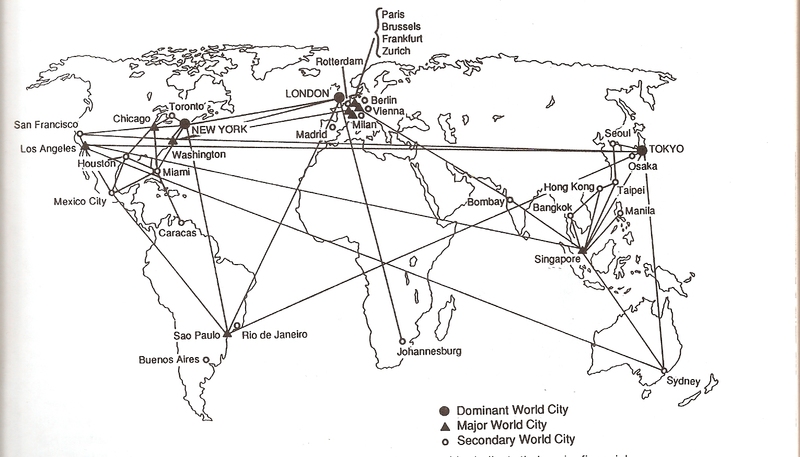 The mega city, city-region, polycentric city, are all manifestations of this 21st century phenomenon. The origins of this city of influence is rooted in the term “world cities”. The term originated in 1915 by Patrick Geddes, an urban planner who used empirically scientific methods of analysis. The term was used to illustrate the importance of a relatively few cities in relation to the world economy. B. Metropolitan agglomerations are growing even though center cities are losing population overall. C. The Wal-Mart distribution model (and now the emerging Amazon virtual/ actual model) and Just-In-Time delivery systems further decentralize the city but expands the agglomeration. Whatever the viewpoint we take, one thing is certain: This dispersal of the city relationships has led to our dependence on the car as a primary mode of transit and economic generation (via demand for oil and the disposition of commerce in the suburban landscape) and trucking as major transport mode even in the face of rising oil prices. The effects of this dependence and potential solutions will be discussed in part 2 of this series. A thorough study of these factors reveals that, contrary to assertions of urban researchers such as architect Rem Koolhaas, there is an overall organization to this new global structure of cities; and it will embolden the center cities. We now refer to these new city systems as Global Cities and Mega- regions. The economic strategy of cities now must encompass foreign policy to be truly global players. Regions, according to according to many urban experts, now compete on a global scale. During the 90s we were preoccupied with the term “World Class City”. Every municipality was determined to be seen as a world class city without truly understanding what that term meant. We were thinking optics and marketing as opposed to true global value. This a key challenge for our Midwest/ rust belt mega-region. Cooperation is critical to cities from Milwaukee through Chicago, Detroit, Toronto and Buffalo. How does the rust belt redefine itself? What we see now is that being competitive in the new world-wide market is the most import challenge for our cities. It not only has economic impacts, but physical impacts. That is the topic of Part 2 of this series.